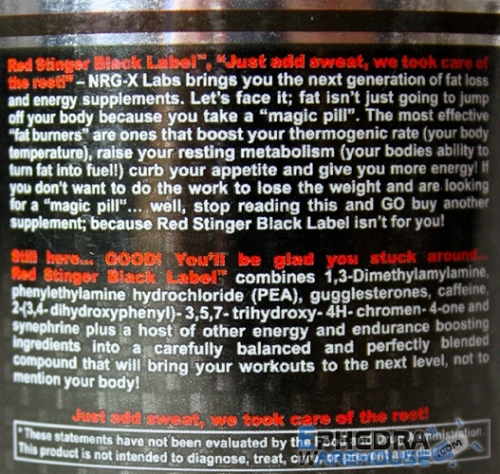 Red Stinger Black Label isn't your ordinary diet supplement. 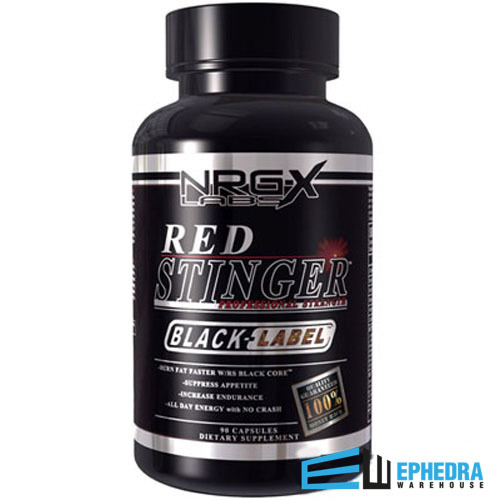 In fact, Red Stinger diet pills by NRG-X Labs are some of the most innovative pills on the market. Why? Instead of telling you that you can take a pill and lose weight, Red Stinger Black Label is designed to support a workout and diet plan. You still need to do the work, but Red Stinger can help. Those who have used Red Stinger by NRG-X Labs find that they might lose weight more easily than with other diet and exercise plans. * While the pill alone will not cause you to lose weight, it can help you feel better about your body and your chances of success. Start with a diet and exercise program, add Red Stinger and you'll see, as others have, that you can reach your weight loss goals. Red Stinger reviews are in. People are happy with their results, and you will be too. Green Tea Extract (98% polyphenols), L-Tyrosine, Caralluma Fimbriata 20:1 extract, Phenylethylamine hydrochloride (PEA), Oxyphenylon (Rubus Idaeus) 99% Ketones, Guggulipids (10% gugglesterones), Zingiber Officinale (5% gingerols), Bitter Orange Extract (30% synephrine), N-Acetyl L-Tyrosine (NAT), Coleus Forskohlii (20% forskolin), Cacao Extract (8% theobromine , White Willow Bark Extract (15% salicin), 2-(3,4- dihydroxyphenyl)- 3,5,7- trihydroxy- 4H- chromen- 4-one, Kelp (brown algae), Alpha Lipoic Acid, Black pepper Extract (Bioperine). This high-powered formulation is designed not only for those who want to drop extra pounds, but also those who want a supplement that can support their health. The supplement is well-balanced and can help a person who wants to lose a little weight or a lot of weight! All you need to do to use Red Stinger black label is to take 1 to 2 capsules on an empty stomach before breakfast. Then take one capsule six to eight hours later, again on an empty stomach. Ideally, you should start with 2 capsules a day to see how your body enjoys Red Stinger and then move up to no more than three capsules each day. Take Red Stinger by NRG-X Labs for up to eight weeks, then follow with a four-week break before using the Red Stinger diet pills again. 1. Brownley KA, Von Holle A, Hamer RM, La Via M, Bulik CM. A double-blind, randomized pilot trial of chromium picolinate for binge eating disorder: results of the Binge Eating and Chromium (BEACh) study. J Psychosom Res. 2013 Jul: 75(1):36-42.